Unique Moments Photography of Gig Harbor Washington introduced "The Tug" 5 yrs ago and its continues to be a fun popular image for our clients. We always capture this image after the wedding is over and usually on the way to the reception. The bridal party usually has a few cool ones in them from the limo ride and everyone is in Party mode. 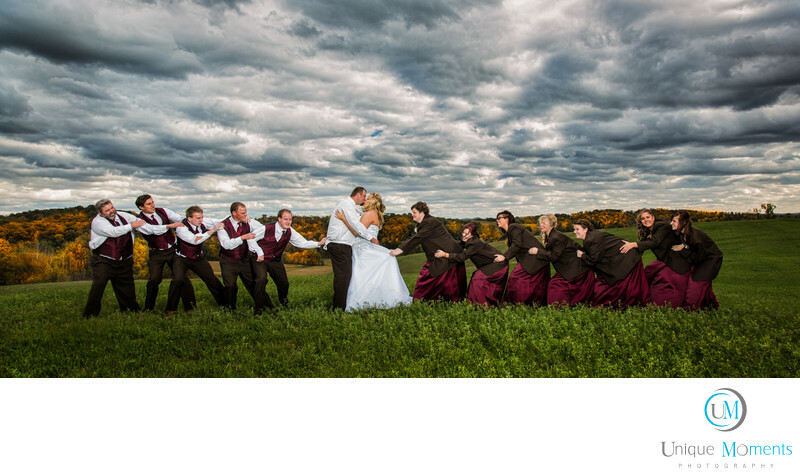 Its a fun shot and it gives us a chance to break up the photo process and capture Fun images that we cant always get at the venues or churches. We always take the opportunity to get some additional outside shots of the guys and the girls at these locations and the images seems to find a way into the albums. This one is a favorite. An approaching winter storm, the temperature was 28 and dropping like a rock. The guys had plenty of antifreeze in them so they gave the girls their jackets and we took the shot out on the alfalfa field of the family farm. Its started to snow 30 minutes later. The sky was killer and the fall colors and green field made for an awesome Image. Location: 36028 osseo Rd Independence WI 54747 SS Peter and Paul Parish. Keywords: Courtney and casey Wedding (6).